ITEMS needed – Raffle Prizes WELCOME!! UNICEF’s Day for Change – Our recent non uniform day raised £276.99. This sum will go towards providing clean water and sanitation in The Gambia. Dance Workshops – Many pupils in S1 to S5 have participated in a session of dancing over the last couple of weeks. Funded by Highland 2007 and contracted by Secondary and local Primary Headteachers, Jammin Fitness delivered a variety of workshops over two weeks. The children taking part thoroughly enjoyed the dancing which included a short performance at the end. It was amazing to see how quickly pupils picked up the moves! Business Dynamics – S6 pupils took part in a two-day enterprise event to raise awareness in aspects of setting up and operating a business in the 21st Century. This event took place in the Myrtle Bank Hotel and gave pupils a chance to take part in designing an ad for a toilet seat (not as silly as it sounds!) and set up a fictitious bike hire company in the area. Thanks to Mr. Sutherland and Sheena Matheson of Business Dynamics for setting up and delivering this event. Read more details of the event here. Cross Country – On Wednesday 6th February, 29 of our pupils travelled to Alness with Mr Caddell and Mrs Macrae for the Ross-Shire Cross Country Championships. The best performance overall was the Senior Girls Team (Meghann Richardson, Amy McLeod, Lyndsay Croal and Jennifer Port) who came third. We also had some very good individual performances. In the S1 race Bella Claydon finished 28th out of 46 and Charmayne Fraser finished 29th. In the U15 race Matthew Fothergill came 30th out of 59 and Gavin Gourley 32nd. In the Senior Boys – Neil Maclean 23rd out of 45. Congratulations to all who trained and participated on the day. Exhibition – Jenny Martin and Spencer Hill have been involved in study sessions at Bridge House Art in Ullapool and are presenting an exhibition of artwork. It is called ‘Finger on the Pulse’ and will be on show at An Talla Solais, Market Street, Ullapool from Sunday 24th February until Friday 29th February (1pm – 5pm daily). Paintings by Jenny and Spencer can be seen along with work by a number of full time students on the portfolio preparation course. Staffing – Miss S McMillan who has been teaching Maths and Computing in the school since 1987 has decided to move onto new challenges. Fortunately for us she will not leave immediately thereby ensuring her current pupils will not miss out on vital exam preparation. She has offered to stay on until we have a suitable replacement. The post has been advertised and more details will be given as the situation resolves itself. Scottish Youth Theatre – Courses are now available in Glasgow and Edinburgh throughout Summer 2008 for young people between the ages of 8 and 25. Details can be downloaded from their website. Deadline is 25th February. The courses are designed to develop drama skills in a professional environment. Past pupils have attended these courses to great success. Oliver – Monday 3rd – Wednesday 5th March – We will be presenting our production of the musical ‘Oliver’, featuring pupils and a few guest artistes! Tickets will be available 2 weeks before the show from the school office. Pupils and staff have been working hard for months to produce a first rate show for everyone to enjoy. Please get in touch with Miss Hunter at the school if you have something you are willing to lend such as top hats, tail coats, a tricorn hat (for Mr. Bumble) knee britches (any size), tankards (pewter or other) – in fact any item which could look ‘Victorian’. Tesco Sports Vouchers – Thanks to all who handed in vouchers. This year we collected over 6,000. An order has been submitted for various sporting items that should be with us soon. Climbing Wall – A bid was made recently to the Great Wilderness Challenge for support in our efforts to attract outside funding for a modern climbing wall that will enhance local facilities. The Climbing Wall Committee is very happy to report that the GWC have sponsored our bid with a donation of £6000. This is a crucial contribution and brings our total to £31500. With 25% funding in place the committee is now in a stronger position to attract funding from other bodies. Read here about our pop concert and click here for some photos! Sheena Matheson of Business Dynamics assembled an interesting and varied group of session leaders for Gairloch High School’s annual S6 Business Awareness Programme on February 13th and 14th at the Mrytle Bank Hotel. The first session was an introduction to business by Dave Charnley, which got pupils talking, thinking and presenting within the first 30 minutes. This was an excellent and thought provoking icebreaker task – creating a promotional ad for a toilet seat! At the end of the session Dave had a Question & Answer session with the pupils to further their knowledge of the price, placing, promotion & product model commonly known as the 4 P’s. After a break engineer Jim Johnston of SGL Carbon ran a session on Research & Development. SGL Carbon make carbon products for a huge variety of uses. These uses range from brake pads for Formula 1 cars, aircraft undercarriage wheels and carbon inserts for beds and mattresses to meet fire safety standards. Jim went through different aspects of the design process and the methods used to maintain quality control before getting the pupils in their groups to design a paper tower that had to support a small water tank half a meter above the table surface. The tower was constructed from paper, Sellotape and paper clips all of which had to be ‘bought’. The completed towers were judged on their cost; team group dynamics, ingenuity and meeting the requirement of the original specification. In the afternoon Simone Nelson talked about her experiences as a businesswoman and how finding a business has moved from word of mouth and the telephone to the internet. She then went on to get pupils involved in the development of some of the more technical aspects of designing a website such as e-commerce, domain names, shopping carts and payment processing. Simone then set the groups a very topical task which was to design the search engine optimisation for a website selling wild fruit cordial which makes couples drinking it together in love! Day two again started with a stunning morning, flat calm across the loch. Last night it was cold enough to freeze the shallow water next to the hotel. The first session of the day came from Steve McDonald of British Telecom. Steve told the pupils about the function of a Human Resources department, including how to prepare for an interview as well as what to look for when interviewing an applicant. Steve then set them the task of having to decide on which applicants would be interviewed for a job. Paula Kirby of Fusion, Inverness led a session on innovation. This started with a very entertaining set of slides showing past and present innovative products. These products included: vacuum cleaners; mobile phones, digital cameras and motor cars. Paula opened up discussion about the ancestry of products, why new products evolve and the effects that they can have on the business world. Some of the activities that Paula asked the pupils to do were design a new vacuum cleaner, think of as many uses as possible for a paper clip and create a system to preserve The Parthenon. Sheena Matheson brought together everything from the two days by setting the pupils a business problem; the pupils formed two companies – ‘Gairloch Bike Tours’ & ‘Brake-Bike Mountain’ to operate cycle tours in the Gairloch area. This business plan had to include management, enterprise funding, e-commerce, finance, human resources and marketing. Gairloch High School would like to thank all of the session leaders and Sheena Matheson of Business Dynamics for providing this excellent opportunity for our sixth years. Thanks also to the staff of the Mrytle Bank Hotel who provided a comfortable and convenient venue for this event. Jim Sutherland, Determined to Succeed co-ordinator, Gairloch High School. Non- Uniform Day – Wednesday, 6th February, marked UNICEF’s Day for Change. 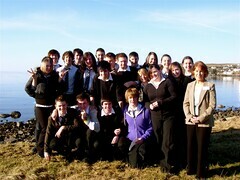 All pupils and staff were encouraged not to wear uniform at a cost. Money raised will help children in Gambia to access safe water and sanitation, something we all probably take for granted in Scotland. S5/6 Prelims – Prelims are now finished and staff are busy marking, writing reports and preparing Action Plans for each pupil.Pupil Support interviews will take place at the beginning of March and Parents Evening will take place on Thursday 6th March. Thanks must go to Irene MacIntyre, Chief Invigilator, for the daily running of exams in the Community Hall and to Colin, our Janny, for his help throughout. S2 Assessment Week – Next Tuesday sees the start of a busy time for S2 pupils as it is Assessment Week for them.Parents of pupils in S2 should have received a letter home recently from Mr.Port outlining the Support Programme for Choosing Subject Options in S3 and S4. Valentine Disco – Next Friday there will be a Valentine Disco for all pupils. ‘Baggy’ Ross will be providing the music. A bus is to be arranged, courtesy of the The Den, on the night of the Valentine Disco for pupils travelling from Shieldaig, Torridon and Kinlochewe. Click here for info on St Valentine’s Day. Duke of Edinburgh’s Award – James Staddon (S3) is helping Torridon Mountain Rescue Team for his DofE Service. Two weekends ago he took part in a fundraising bike wash at the Strathpuffer 24 hour endurance mountain bike race. Taking two-hour shifts through the day and very long night, he helped raise over £700 for North West mountain rescue teams. Well done James! Midterm – School re-opens on Tuesday 11th February, so enjoy your long weekend! Other dates here. Weather – The first two days of February reminded us that we are in the middle of winter. The school closed when power failed across wide areas of the community. Conditions then deteriorated when snow stated lying on the roads. Parents are reminded that the school phoneline is updated as quickly as possible throughout such conditions. We also make use of BBC Radio Scotland, BBC Radio nan Gaidheal and Two Lochs Radio. All the details are available on the school website here. Oliver – During the first week of March, (Monday 3rd – Wednesday 5th.) the school will be presenting its production of the musical Oliver, featuring pupils and a few guest artistes! Tickets will be available 2 weeks before the show from the school office. Pupils and staff have been working hard for months to produce a first rate show for everyone to enjoy. Miss Hunter in the Music department would like to take this opportunity to appeal for items which may be out there in the community, and which could be borrowed (and well looked after). These include: top hats, tail coats, a tricorn hat (for Mr. Bumble) knee britches (any size), tankards (pewter or other) – in fact any item which could look ‘Victorian’. Please get in touch with Miss Hunter at the school if you have something you are willing to lend. • collected by us – call the school office on 712275 and leave your details. We need your support so please help. Half the money funds our outdoor education week for S1 at Nethybridge and the other half goes to charity.